By popular demand—yes, because both of you demanded it—my weekly round-up of new comics recommendations is arriving before the sun sets on any corner of the United States. Do not go to a comics store without consulting these tips. Do no download new comics through the ComiXology app without studying these recommendations. Batman Incorporated #7 Just because the previous issue of Batman Incorporated was one of the best Batman stories of the year, should you expect the new issue to be any good? Yes, you should. This issue: Native American Batman decides whether to join Bruce Wayne's crew of international Batmen. I'd roll my eyes, if this wasn't written by Grant Morrison. The man writes great Batman tales. FF #5 There hasn't been a bad (or visually dull) issue of this new Fantastic-Four-minus-Human-Torch series yet. Official summary: "The War of Four Cities: Part Two As the War of Four Cities heats up, the Universal Inhumans enter the fray! What role will the FF play in things to come? Prepare for epic battles, live lost and saved, and the awaited return of a beloved Marvel hero!" Rocketeer Adventures #2 Creators involved in this issue include Mark Waid, Chris Weston, Gene Ha, Darwyn Cooke and Geoff Darrow (doing a two-page pin-up). That makes this a pretty safe bet. Scalped #50 This is one of the best series published now, so celebrate its 50th issue by buying it. Writer Jason Aaron has been chronicling the lives of people on a modern American Indian Reservation, including the lead character, who has returned as an undercover FBI agent. Summary for this issue: "This landmark fiftieth issue features two special stories, one detailing the long bloody history of scalping and scalphunters, and the other spotlighting the founding of the Prairie Rose rez as seen through the eyes of Dash Bad Horse's ancestor, His Many Bad Horses." Ratchet & Clank (trade paperback collection) Official summary: "The bestselling Sony video game franchise is now an action-packed, galaxy spanning comic. With Dr. Nefarious defeated and the universe safe, galactic heroes Ratchet and Clank return to the Solana galaxy for some well-earned rest and relaxation. But when entire planets begin disappearing from the universe without a trace, Galactic President Qwark calls them back into action to solve the mystery. Collecting the 6-issue miniseries!" Sonic the Hedgehog #226 Official Summary: "Genesis' Part 1. You know the hero, you know the villain, but you haven't seen anything like this! 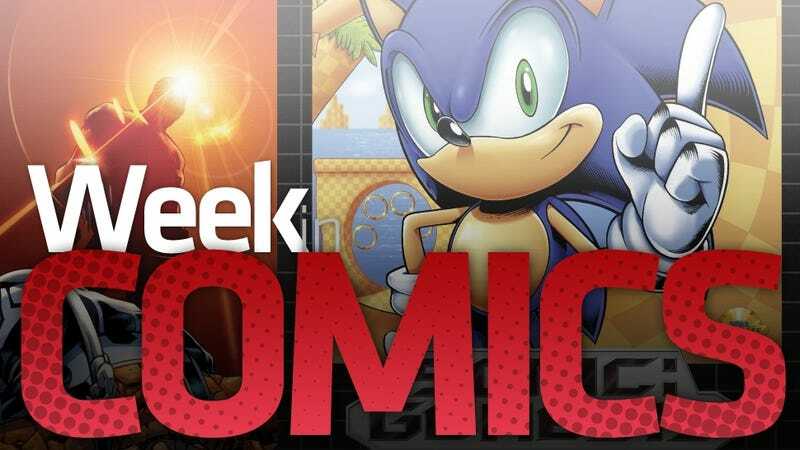 It's a brand new adventure as Sonic the Hedgehog investigates the disappearance of many woodland creatures, the sudden army of badniks, and the strange sinister man behind it all. It's an all-new beginning!" Comixology's Comics app (iOS, Android, web browser) features new releases of new and old comics each Wednesday. Four issues of the Detective Comics run starring Batwoman and, more importantly, illustrated by master-draftsman J.H. Williams were added to the ComiXology shop this week, $2 per issue. For some reason five issues of the late '70s comic Firestorm: The Nuclear Man, by Gerry Conway and Al Milgrom were added to the shop, $1 each. I've complained that ComiXology sells very few super-hero comics published from before the 90s. I'd happily buy older ones, cheap. These Firestorm books, random as they seem, are exactly what I've been asking for. I wasn't asking for an Aquaman-Joker team-up/rivalry/whatever, but apparently that's what happened in Legend of the DC Universe #26, also now available in the digital shop. The first two issues of Brian Michael Bendis and Alex Maleev's Scarlet are now for sale, but I don't know if they're anywhere near as good as the duo's Daredevil. Approximate Continuum Comics This was easy. I love most Lewis Trondheim comics. Trondheim is the writer and occasional artist of Dungeon, a series of clever, yet silly, swords-and-monsters fantasy graphic novels that I've praised in previous installments of This Week in Comics. Trondheim is a sharp writer and an expert draftsman. He's also French, often published in black and white, and not someone who does any work with super-hero comics. Because of that, sadly, you may not know him or his work very well. Change that. This Trondheim volume, Approximate Continuum Comics, is a collection of memoirs that the great cartoonist created in the late '90s. It's full of tales of nutty friends, strange Japanese publishers, horrible party guests and other colorful characters, including Trondheim itself. In the back of the book, Trondheim's friends and wife offer rebuttals to correct or re-frame how Trondheim presented them. Their brief revenges are a great dessert.